So my day started out with me supporting my daughter who had to get to work early. 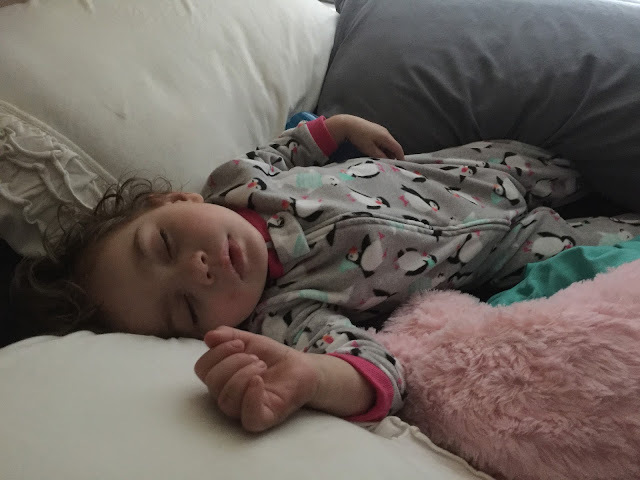 So I got to get sleepy head "Fia" up (Sophia calls herself this...lol), feed her and run her to daycare. She did not want to wake up at first so I let her sleep a bit longer. But just in case you needed to see a cute baby sleeping. There you go. My Nu Wave oven came so I cleaned it out and practiced setting it up. Ran it a few times to make sure it worked well and then I got my first coat of paint on little Celeste. She did very well and was super patient through it all. She will be a Caucasian baby but I hope in the future to do some ethnic versions of her too. So please be patient. I don't have those paints yet but in March I am going to buy a set. So I will then do my first ethnic baby. 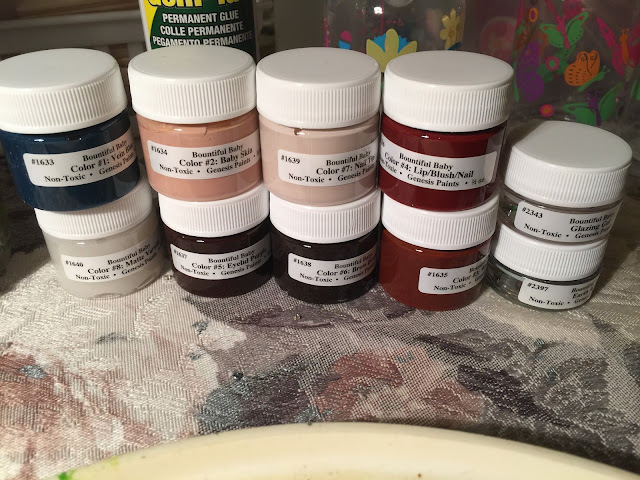 I got my first large set of Genesis Heat Set Paints. I am excited to have a larger supply. It was painful to buy but I decided that most of the heat set painted dolls look very life-like and I was afraid of all the horror stories I heard about Acrylics. However that being said, later I will try that too just to see if I can and to see what the differences are. Luckily I had some Odorless Paint Thinner already. I had gotten various brushes from my oil painting too. But I did pick up a cheap detail set at Walmart when I was there getting my glasses fixed. I would say it's quite a few hundred dollars to get set up. And I know I am no where near prepared like I have no eyes stocked up or any of that stuff. I am still debating on Glass vs. Acrylic eyes. Glass Eyes are pretty darn expensive. I am still looking around for good German glass eye vendors but I may have to use Acrylic eyes until I find some glass ones I can afford. 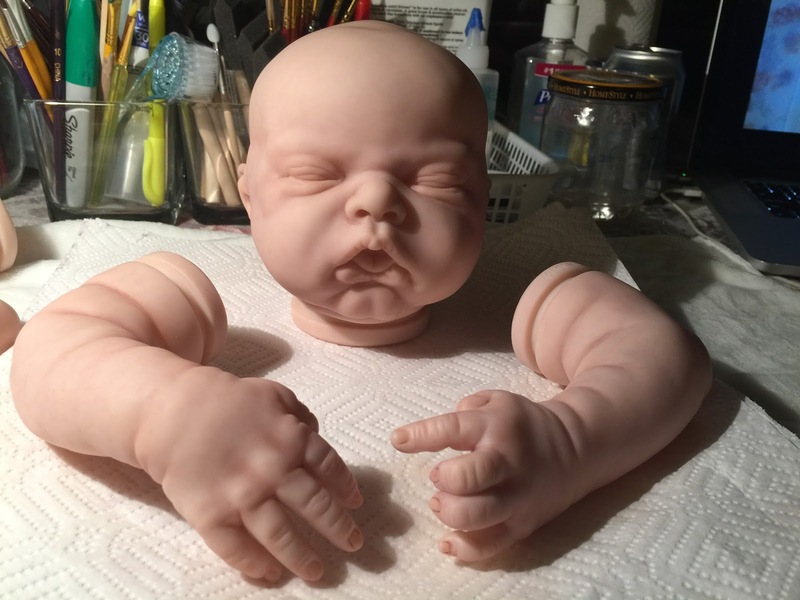 Bountiful baby seems to have nice Acrylic eyes that look really good. But then again I saw a bunch of gorgeous eyes at McPherson Crafts. I am doing tutorials and got my first base skin layer on. I feel it is all going very smoothly. Probably because I have been an artist for years, painting with acrylic and oils, doing graphic arts, 3d art and game art. I also sell photo stock and graphic stock at several sites like Shutterstock and Fotalia. Drawing, designing, painting, sewing, creating. That is my forte. 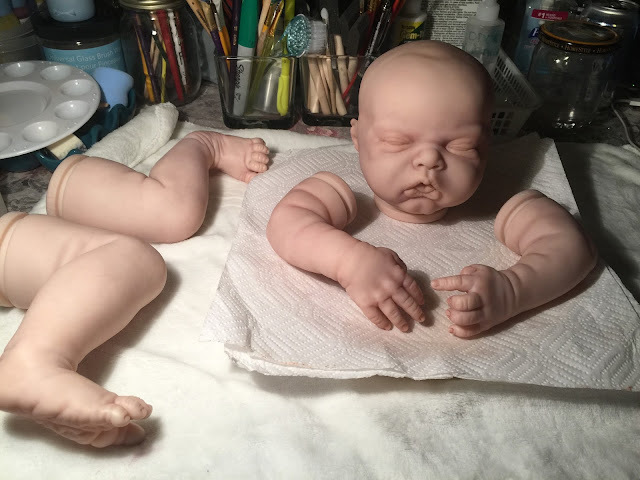 I shall have a ton of fun creating these gorgeous babies. 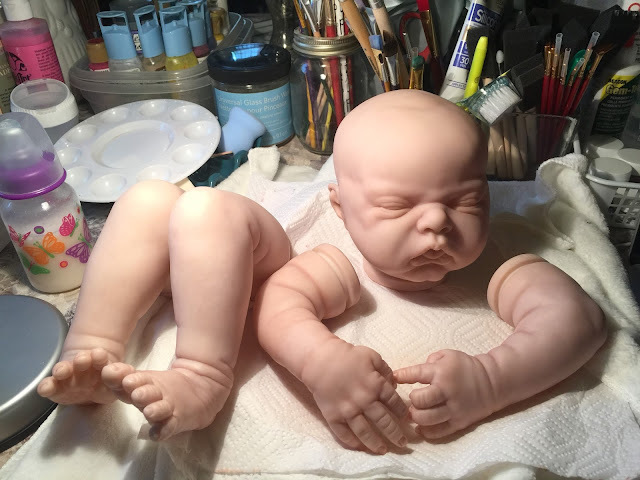 Not only will I have fun but I hope some expectant Reborn Mommies will be thrilled with their adopted Reborn babies. Well I got her all set up in the NuWave oven and put it in my well vented bathroom, however I am going to put it in the garage or outside in the future. I just was working very late and did not want to go outside. It worked very well. I noticed the vinyl sort of expands slightly when it is warm and it smells pretty nasty. It might even flare up my asthma if I wasn't using the bathroom fan. I thought about opening the bathroom window too which could work out well. But with several asthmatics in the house and toddlers we need to get something set up permanently that I can use late at night because that is when things are quietest in my house. It also helps that I am a night owl. And I mean a serious night owl. I am lucky if I get to bed by 3-4 AM. I got through some mottling tutorials and this baby started looking way more alive than before. I even added some slight shading in my mottling layer. I did a blue mottling layer twice, then a dirty purple mottling layer twice, then I did a periwinkle mottling layer once (not sure why), and then a blood red mottling layer twice, as was instructed. She is really starting to look like a real baby. Whoa....head trip. Is that a real baby laying there or a doll. I can't wait to see how she looks after veining and more detail layers. 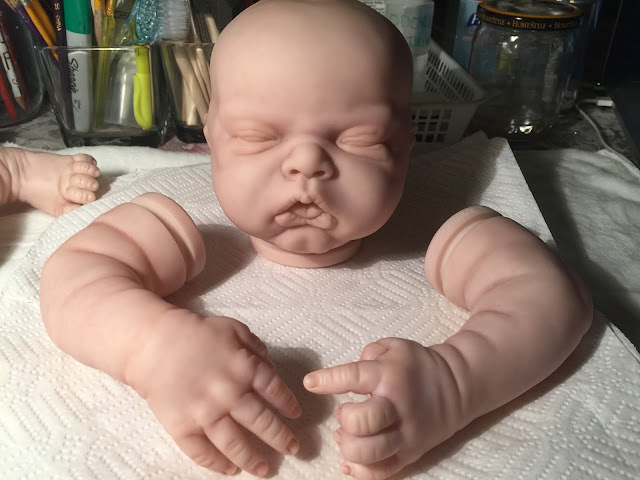 Here you can see how I was going for an ultra realistic baby look. She is only halfway through her painting and requires much more work. But that took me pretty much most of the day. I am loving all her fat folds and creases, the various mottling layers really helped bring those out. I am already shading a bit as I mottle, and I can't wait to finish off her nails. Woo hoo! Her right leg came out beautiful. I am so proud of myself. I knew I could do it. It still needs details and other layers so be patient as I layer away. But I can already see those tiny details that came out due to the mottling. 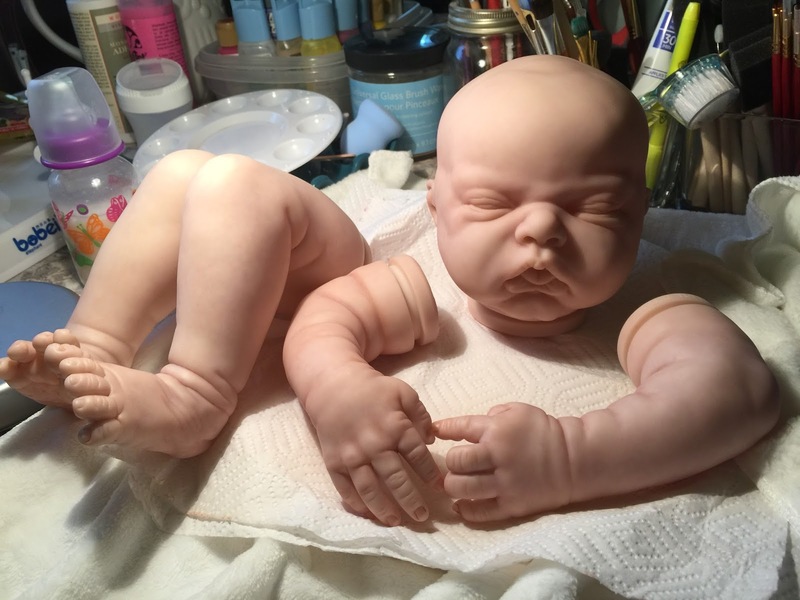 I saw someone's Reborn the other day and I was horrified at the way their mottling came out. You could clearly see sponge marks. 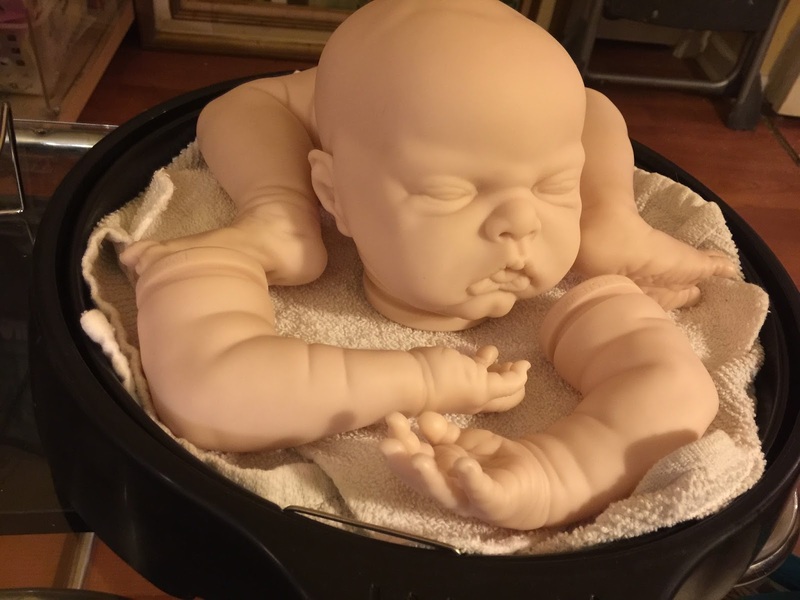 I don't think you should be able to tell that there are sponge marks on a reborn. More dabbing and blotting will certainly help it not look so unreal. 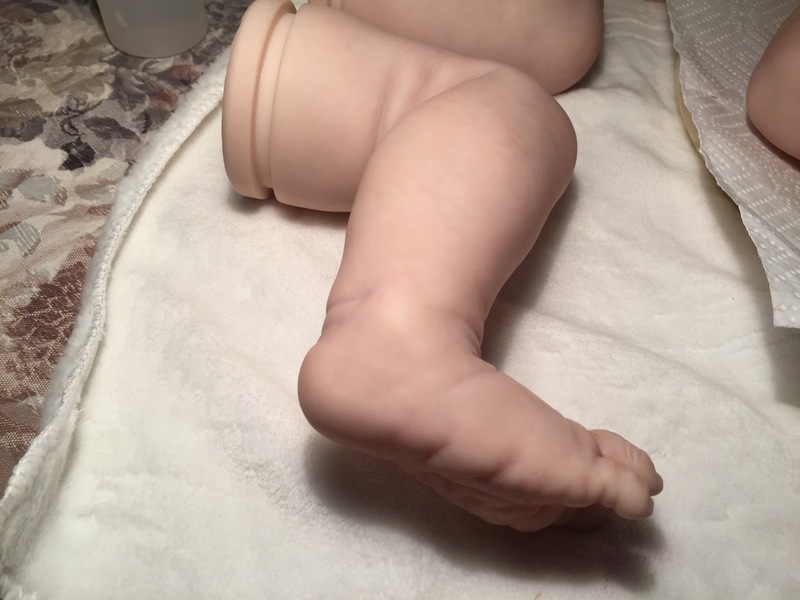 I just love all the wrinkles around her ankle here, they picked up the mottling layers so well. 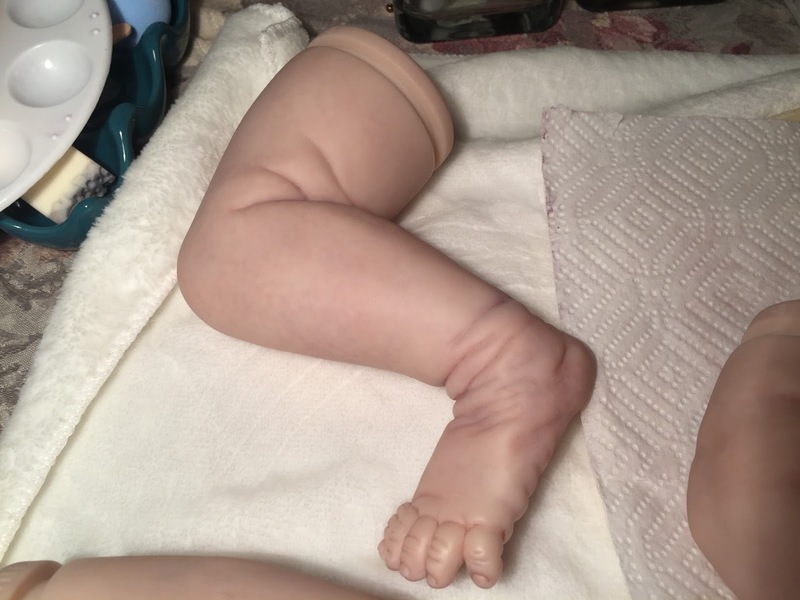 Her little foot looks so sweet and ready to put back in her socks. I can't wait. I feel like she is sitting at a high chair here getting ready to eat. 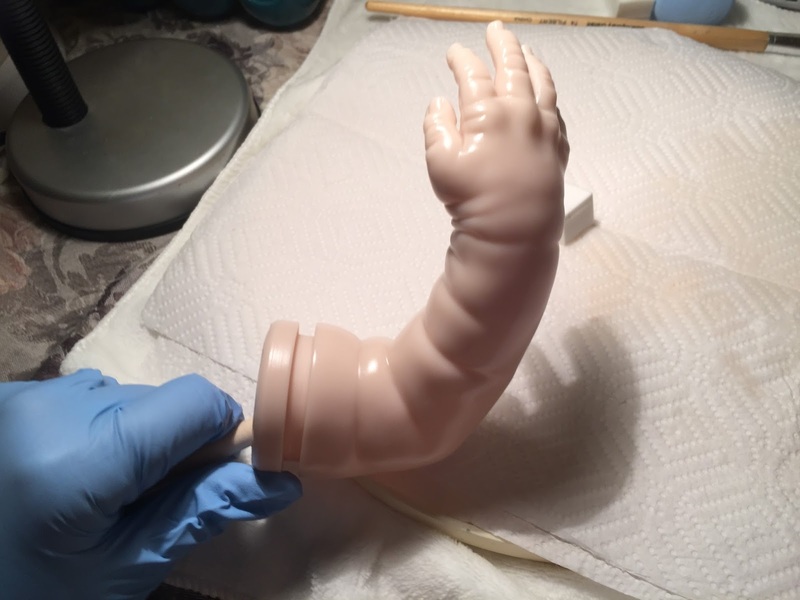 Psyche...she is just waiting for her body so she can play! I remember those spaghetti days where my kids were covered from head to toe with Spaghetti...those were the days...Now my youngest is 13 but I also have custody of my 3 year old grandson half time so I am sure we will have a few more Spaghetti days here or there. I am sure Celeste can't wait to be old enough to have Spaghetti. I found this amazing soft blanket-y fabric at the dollar store on which I am painting. It feels just like a baby blanket even though it was meant for drying cars...What??? Yep. It was a car washing cloth I found at the dollar store. See my dollar store haul for Reborns later on! Celeste is liking it for sure and so am I! I might go back and stock up on those soft car cloths. They feel like high quality baby blankets. So weird, right? You know like they say, K.I.S.S. Keep It Simple Stupid. I will follow that advice for sure. 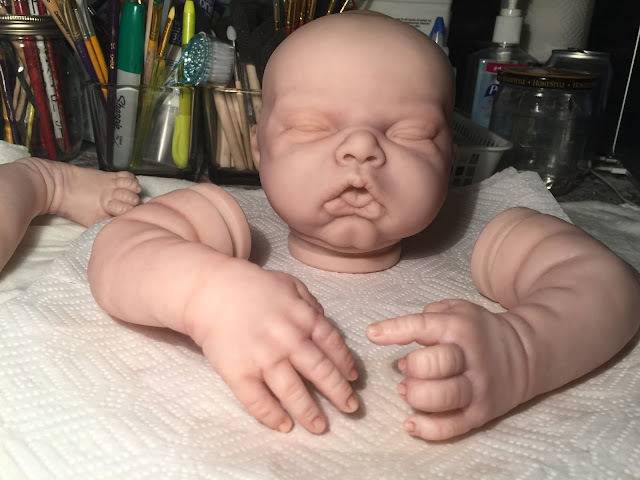 I want to make sure Celeste is finished beautifully and I have confidence she will be beautiful when she is finished. Ta ta for now! Come back and visit soon!